I've only discovered one problem with being a blogger and it has to do with the fact that I now want absolutely every single makeup product on the planet. 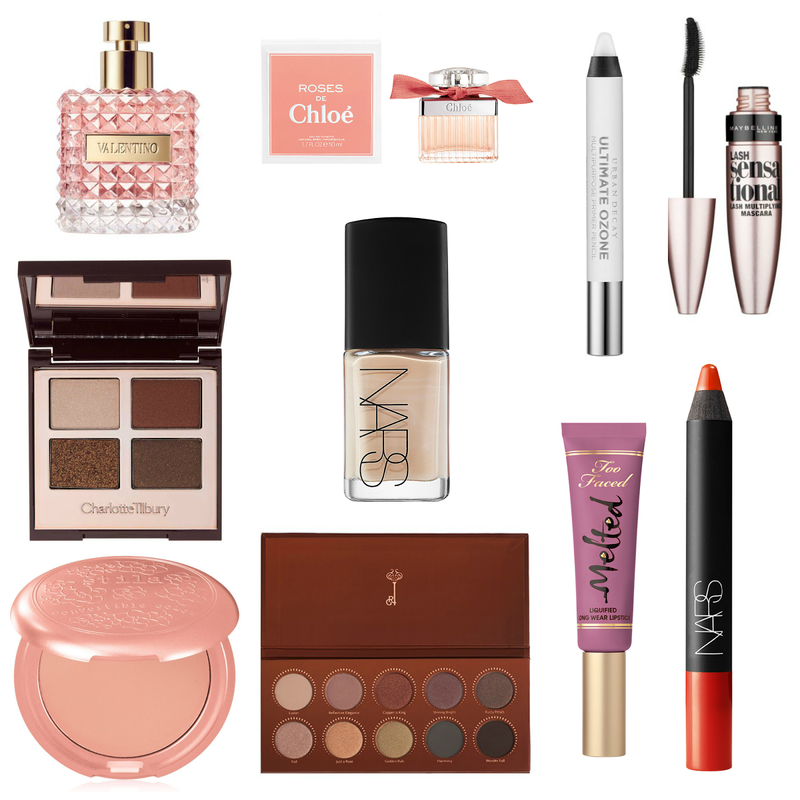 Okay, so that's a little bit of an exaggeration but the 'Beauty Wishlist' note that I keep on my iPhone has reached a completely ridiculous length and in an attempt to control my spending and avoid any impulse buys I thought I would put together another Wishlist Post. Plus, my birthday is in less than a month so at least I have a valid reason to treat myself. Prepare for an overload of Autumn hues - think dusty rose shades, lots of soft but musky lavenders and enough metallic, golden shadows to paint the eyelids of the entire nation! And, of course, there's a few essentials thrown into the mix. So, here's what I'm dying to get my hands on this Autumn and I'd love to know if any of you have tried any of the products above! Make sure you let me know what's on your Wishlist for Autumn too... I'm sure I'll find space to add to mine before the season is over! I was looking through my jewellery box a couple of months ago and I discovered my old Pandora collection. I used to adore collecting charms when I was younger and stumbling across them made me realise how much I still loved the style and concept. I was desperate to start updating and maturing my collection considering 15 year old me obviously thought the right thing to do was to buy every bloody animal charm imaginable (seriously, I have the tortoise, cat, horse, bear, hedgehog... need I go on?) My only problem? Pandora is so unbelievably expensive these days and to be perfectly honest with you there are other things in life I'd rather spend £40+ on (I'm looking at you Jo Malone!) So I decided to hunt for cheaper alternatives and funnily enough a few weeks later an email appeared in my inbox from Soufeel who kindly offered to send over a bracelet and 5 charms for me to review. The universe can act is such mysterious, freaky ways sometimes but I'm definitely not complaining! Soufeel are a company based in Hong Kong but they ship all over the world and provide free shipping over £39 and a 365 day returns policy. They seem to always have a sale on and they have really great discounted items too so I found their prices to be really reasonable. I was quite impressed to learn that their charms are 925 Sterling Silver (exactly like Pandora!) and they used Swarovski crystals in their jewellery too. This being said I was still a bit wary and unsure what to expect when my bracelet arrived. I was, after all, once a huge Pandora snob but in all honesty I was truly surprised and really impressed when my Soufeel jewellery landed on my doorstep. So much so that I'm actually considering putting in another order next month! Onto the charms! When I started narrowing down my choices I didn't really have a theme in mind but my finished result has a kind of beachy vibe to it...with a random Eiffel Tower stuck in for good measure! Paris obsessed I couldn't resist the Eiffel Tower charm* and it reminds me of the wonderful time I had in the city last Christmas (which I actually blogged about here if you were interested!) The thing I was concerned about when I picked this charm was the colour of the silver itself. I was hoping for a bright, shiny silver and not a darker, dull colour and I was so happy when it was exactly as pictured and what I was imagining it to be. Next up is my little Starfish charm*! I know I was trying to stray away from the whole animal charm theme but I could not resist this cute little guy. The crystals really sparkle in the light and I love the pop of colour it adds to the bracelet. My Equinox Flower Murano Glass Charm* is probably my favourite of the 5 and I can't quite capture in a photograph how beautiful this is. As you move your wrist the colours change from purple to an almost red/pink colour then to orange and it's literally like there's a sunset captured inside the glass. The Pearl Pendant Charm* is a piece I thought would actually look beautiful in so many situations: on a necklace, with a group or even alone on a bracelet. My final charm, which I can't seem to find on the website anymore, is my Silver Crystal Charm*. To complete the overall look I wanted to add more silver and an extra bit of sparkle is always a bonus. For the bracelet I opted for the Double Silver Grey Leather charm bracelet which seems to be out of stock at the moment but the Single version can be found here. In retrospect I actually wish I'd picked up the single version as the double one that I picked out is a little bit too big for me. Considering I have tiny wrists (I wear the smallest Pandora size) this was my own fault but as far as quality goes I'm really impressed with this. The colour is lovely and the quality of the leather is identical to my Pandora one and the clasp is really secure. I think it looks wonderful with the 5 charms and I can't fault it or Soufeel as a company in any way really! If I was ordering from Soufeel myself for the first time one thing that would definitely worry me would be shipping/handling and how the items are packaged. I didn't exactly keep track of how quickly my order arrived but I know it was just over the week mark. My items arrived safely and were secured in a box lined with bubblewrap and the items themselves were contained inside a bubblewrap protective envelope (the yellow parcel in the photo above!) Each charm was packaged individually inside a lovely lined Soufeel box with the prettiest blue ribbon and they even included a gift bag just in case! With their 365 day returns policy, cheap prices and lovely packaging I have to say I'm truly impressed with Soufeel as a company. What do you all think of their jewellery and the pieces I picked out? If you'd like to shop at Soufeel I also have a coupon code for my readers which entitles you to 5% off any order. Simply enter BLOG5 at the checkout and you're good to go! * This post contains a PR Sample that was gifted for review however I am not sponsored by Soufeel and no affiliate links have been used! It's been just over 2 months since my first Instagram Diary and I couldn't think of a better time to post this other than on a lazy Sunday morning! This summer hasn't been too eventful but a couple of exciting things have occurred between this Instagram post and my last, including the fact that I graduated from University with a BA in English Literature! I'm not exactly too sure what to do with myself right now and I feel like I'm living in limbo with job-hunting slowly taking over my life (seriously, if anybody needs a new Content Marketing Assistant / PR Assistant / Digital or Social Media Anything I volunteer as tribute!) but whatever happens I'm pretty excited for the future and I actually cannot wait for Autumn to finally arrive! I can't decide whether I'm more excited about cosy knitwear, berry lips or thought of a crackling fireplace at night. What's your favourite thing about Autumn? 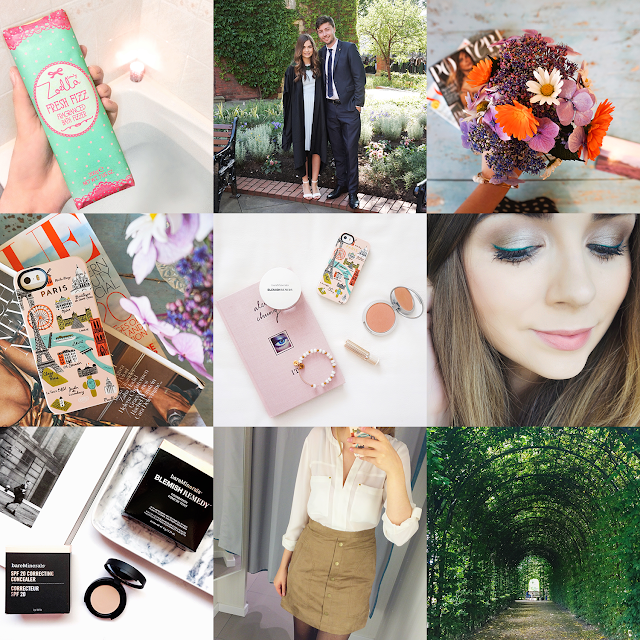 I'm still a complete and utter failure at sticking to an Instagram theme but I suppose some things will never change! I've picked up so many new products in the past few months and I can't wait to write about them: my favourites so far have to be bareMinerals' new Blemish Remedy foundation and the Balm's Cindy Lou-Manizer highlighter (which I bought so spontaneously after falling instantly in love after seeing it on a random YouTuber's cheeks). Non-beauty wise I've developed a little bit of an addiction to suede and I now own 2 suede skirts - a mini and a midi - and I don't think I'll be taking them off until next March. I also finally picked up my phone case of dreams from Rifle Paper Co. I'd been eyeing the Paris case up for almost half a year now and I finally found it online (and on sale for too!) at the Northlight Homestore and I'm so unbelievably happy with it. A few other exciting beauty related things include my new found love for coloured eyeliner, specifically emerald green. After picking up Latest In Beauty's Awards box (you can find my post on this here) I fell in love with Daniel Sandler's Green Velvet eyeliner and it's such a fun way to add a pop of colour into a makeup look. And, speaking of Latest In Beauty, I was also one of their Winner's Box Competition winners and I was kindly gifted a Winner's Box which is probably the best beauty box I've ever received! Did any of you buy it? This post has been sitting in my drafts for quite some time now and I've been itching to tell you about the new lip formula I've been absolutely obsessed with for the past few months. Ideally I really wanted to include swatches of these Oil-Balms on my lips but the changing weather has simply wreaked havoc and my poor lips aren't exactly looking too fabulous right now. It happens every year, my lips are so sensitive (seriously any recommendations on intensive lip care would really appreciated! I've tried Nivea, Nuxe, Blistex... the lot! ), so it's really my own silly fault for not swatching them earlier. So you'll simply have to live with some dodgy arm swatches for now, sorry guys! Anyway, onto the gorgeous Pop of Passion Lip Oil-Balms from bareMinerals which I'm sure you've all heard of by now. I have three shades: Plumberry Pop*, Tangerine Pop* and Peach Passion and it's taken all of my willpower not to buy the entire collection. I was kindly sent the two 'Pop' shades from bareMinerals (alongside one of collection's Blush Balms which I've reviewed here) and I loved the formula so much I just had to pick up a more subtle Passion shade for the days when I was in the mood for a neutral lip. In total there are 8 colours in the collection, 4 Pop shades and 4 Passion shades, and for once I think I love every single colour! After purchasing the newly formulated Rose Jam Bubbleroon a month ago (which is now rose shaped and bright pink with gorgeous pink glitter *swoon*) I've developed a little bit of a Lush obsession and it seems like the rest of the blogging world has too - Lush is literally all over my Instagram feed lately! I remember back in my pre-University days when Lush bath bombs were my kryptonite and I simply couldn't walk past the shop without picking one up but after moving to University Lush just slipped out of my mind... I couldn't exactly enjoy a relaxing bath in my tiny shower room! Now that I've graduated and moved back home Lush is constantly on my mind and I'm eager to explore their products properly this time instead of just beelining straight towards the bath bombs! I headed to Lush in Newcastle last week and picked up a few products from my wishlist and I'm actually planning on reviewing each product individually so expect lots of Lush reviews in the near future! On the top of my list was one of Lush's Solid Shampoo Bars, a product that baffles me just as much as it excites me... the concept of using anything but a liquid to clean my hair feels a little bit strange but as I'm constantly travelling to and from Tynemouth I thought it would be perfect to travel with. Originally I was planning on picking up Honey I Washed My Hair but after I sniffed Jason and the Argan Oil I immediately knew it had to come home with me. It smells exactly like the Rose Jam Bubbleroon and Ro's Argan Body Conditioner (my all-time favourite Lush scent!) so it was really a no-brainer and I actually let out a little squeak of excitement in the shop when I realised I could finally have Rose Jam scented hair like I'd always dreamed of. Apart from inhaling the scent of this a lot more than I care to admit I haven't actually used Jason and the Argan Oil yet but I'm planning on testing it out tonight. I'm so excited to see how it lathers up and if it lives up to its promise of delivering stronger, shinier and softer hair! So it turns out I still can't step into Lush without buying a bath bomb or two but with all the new releases Lush have brought out it was difficult to resist! I walked in with my mind set on buying The Experimenter but sadly I didn't enjoy the scent. Still wanting my bath to look like an explosion of colour I picked up Intergalactic, a ridiculously glittery bath bomb. With a fresh peppermint scent this will be perfect for in the morning and I think I'm going to save this for the weekend so I can truly take my time and enjoy it! I'm so excited to watch this little guy dissolve! I also picked up Twilight, a long time favourite of mine which I love to use in the evenings to help me unwind and sleep. This is packed with essential oils like lavender and ylang ylang and it leaves me feeling so moisturised and relaxed. I adore this and I've missed using it so much, I can't wait to light some candles and hop in my Twilight bath with a face mask and a good book! My skin has been feeling really blah lately... there really isn't another word for it. It seems to have lost its glow, it's becoming super oily and I've just been feeling a little miserable about it. To me, face masks are the ultimate form of pampering and if anything can help my skin I knew a fresh, natural face mask would do the job! I wasn't sure which mask I was going to pick up when I visited Lush but after a lot of sniffing and a lovely chat with a super friendly Lush girl (seriously, the Lush staff are so helpful!) I narrowed it down to Cupcake and Love Lettuce. I opted for Love Lettuce due to the exfoliating properties from the crushed almond shells and the soothing lavender oil and honey sounded perfect for my skin! This is actually the only product in my haul I've used so far (2 times to be exact) and so far I'm really impressed. I'll save the rest for another review but my skin and I love this and I'm truly enjoying using it. I can't wait to pick up another without exfoliant in it so I can use the masks more often. I was also given a huge sample of Cup O' Coffee from one of the loveliest girls at Lush who helped me choose Love Lettuce. You don't have to store Cup O' Coffee in the fridge like the fresh face masks so it has a much longer shelf life and it's also an exfoliating mask like Love Lettuce. I'm intrigued to try this as I've been hearing quite a lot of praise about coffee scrubs around the blogosphere and you can use Cup O' Coffee anywhere, it's not limited to the face! I'm saving this for an early morning when I need a little pick me up as it has a super strong scent and it's guaranteed to wake me up! Have you picked up anything from Lush lately?